If you’ve read this blog before, you know, I have dreamt of being a bride since I was 4 years old. My first choice of location was a haunted castle in Ireland. I am not sure if that had to do with all the time I was spending at Ceili’s, two of my best friends being Irish, or my dad’s claim to fame that we are descendants of an Irish king, but I thought it would be so magical being so in love and vowing to stay that way in a far way land. Years later, I discovered a beautiful wedding location on Vancouver Island by the name of Tigh-Na-Mara Resort ( http://www.tigh-na-mara.com/ ). I checked out the menus, the accommodations and was sold when I saw their amazing spa and grotto pool. I am very driven by the sea and for the short time I lived by the ocean in Vancouver, I felt like I was finally home. I could imagine a whole family and large group of friends really having the time of their life at this place; the photographic opportunities that were there as well as the relaxing atmosphere would be perfect. Fast forward a few years later and I meet Josh. In exception to my two year stint in Vancouver, we are both born and raised Calgarians. 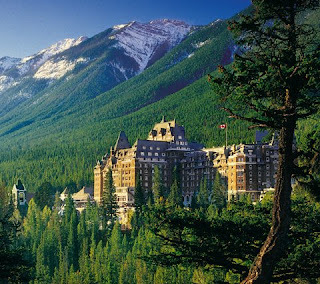 When we started discussing marriage, we were both really into the idea of the beautiful Banff Springs Hotel (http://www.fairmont.com/Banffsprings/). We had spent a very special few days there together and we said those few days were the best vacation we had ever had. I immediately looked into pricing (probably one of the pricier venues in Alberta! 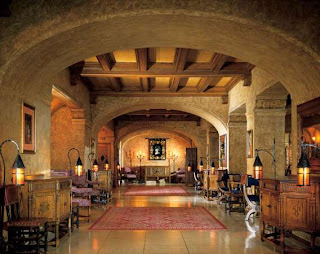 ), ceremony and reception rooms, menus and photographer’s blogs who had covered Banff Springs weddings. It is one of the most gorgeous places I have ever had the pleasure of staying at, and love to show it off to any visitors coming from out of town. We were fairly convinced this was the place. The more I thought about the wedding being even and hour away from Calgary, the more I felt uncomfortable with the fact that maybe people could not afford to stay there, possibly guests could not make it if it was out of town, and also, how would we get in our Saddledome pictures, the railroad tracks, Stephen Avenue, the Calgary Tower, all the things that we know and love about Calgary and have grown up around. I didn’t like thinking that we would not be able to fit these into our wedding. So that brought us to the conclusion we were not meant to be a destination wedding type couple, there are too many nostalgic feelings in Calgary, and too many guests that we need to have by our side come the day. 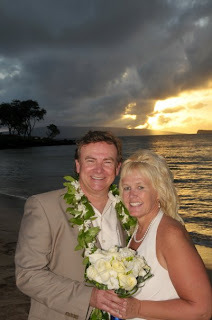 Now, this all being said, I have attended a few destination weddings, one being in Cranbrook (okay, this is a destination for us, because we had to leave the city…) and my dad and his new wife’s wedding in beautiful Maui, Hawaii. 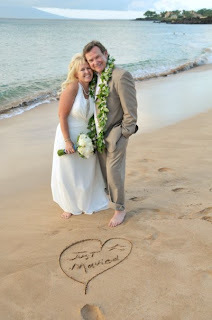 From the beginning, they wanted to have a wedding in Hawaii, and make it more about the joining of families than anything. 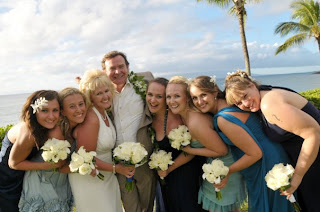 Sue has two daughters, my new sisters, and my dad has four daughters including me. 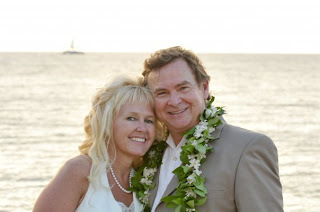 We were so very lucky to stay at a beautiful mansion in the hills in Hawaii, and have perfect weather every day. I instantly fell in love with Hawaii, what a magical place, and what a wonderful atmosphere to commit your love to someone. On the day of the wedding, my dad and his daughters went to the beach and swam and snorkeled with the vibrant tropical fish and a famous sea turtle affectionately known as Volkswagen, what a sign that this day was going to be perfect. We went back to the house, got ready for the big show and drove to the hotel for the ceremony and reception. We had a quick rundown with the wedding coordinator there and then the ceremony got under way. The processional included a Native Hawaiian conch-shell blower and a beautiful fire maiden, we all walked in, representing my dad on his side, and Sue’s daughters by her side. 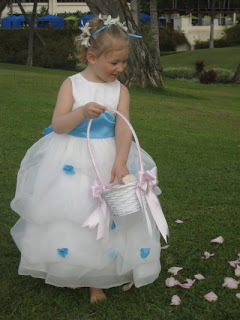 When I saw little Brooklynn with her gorgeous dress tossing flowers, leading my dad in, the tears almost started right there, I am going to be a disaster at her wedding! My sisters and I were all very weepy the whole time, as it meant a lot to us to see our amazing dad so blissful marrying the woman that has done that to him, in such a breathtaking setting. As they were saying their vows, my younger sister Caitlin poked me in the back and said “look!” I turned around and there were whales breaching in the ocean. Wow. Could it be any more magical? My mind was officially changed for destination weddings. My dad and Sue had everyone (ok, there were people missing, but still…) they loved watching them in one of the world’s most gorgeous places commit their lives to each other, and then celebrate that night over a delicious dinner and some crazy dancing (had nothing to do with the Mai Tai’s being served!). The week was great with snorkeling, matching sister tattoos, a wonderful luau, and days of relaxation and celebration. Leaving my city for my wedding will never be an option for me, but I know different things work for different people, and I now know how absolutely magical and fun a destination wedding can be. On a side note - I think my dad has possibly breathed a sigh of relief that I have downgraded my wedding plans from a castle in Ireland, to a castle in Alberta…to a hotel in Calgary, what low standards I have, ha ha! Love it! 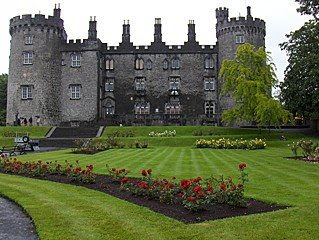 I think that might just be the castle that Adam's parents are staying in for the upcoming trip to Ireland. They, however, are going for their 35th wedding anniversary... so maybe later on in your marriage you'll be able to dream much bigger. Regardless, we all know your wedding will be the most magical of all! Love you!